I’ll admit that I requested this book primarily because of the title since I share a surname with the titular character. Aside from that, I enjoy middle grade and young adult fiction, and the fantasy twist here is pretty unique and interesting. Most of us were embarrassed by our parents at some point in our past – usually at about the age of Fovea in the book. But Fovea Munson maybe has a legitimate reason to be embarrassed … her parents are doctors who run a cadaver lab. Seventh grade is tough enough, but when your parents work with dead bodies and body parts all day long AND they want you to become a doctor like them, life couldn’t get much worse. Well…maybe it could. It would be worse if their secretary quit and they hired you over the summer to work in the cadaver lab with them. 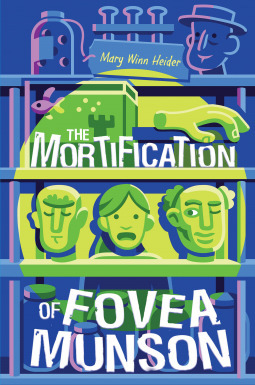 The Mortification of Fovea Munson is charming and witty and more than a tad bit quirky. Her parents are lovable goofballs with good hearts and good heads on their shoulders. Not everyone here is like that, though … I mean, not everyone has their head on their shoulders. In the cadaver lab, a shelf full of heads get Fovea running as she makes promises to them in order to get them to reveal the location of a missing head. But before they’ll give a heads up, they want to sing in a barbershop quartet. With an audience. Does this make much sense? No…but we’re discussing talking cadaver heads, so we’re clearly in an ‘anything goes’ sort of situation. The general story is pretty off-the-wall, but Fovea (yes, the name seems a little strange and she addresses it in the book) has some struggles that will be recognizable to age-appropriate readers – friends, bullies, embarrassment, feeling like an outcast, and struggling to find her own way when it seems like others are trying to steer her in a different direction. These are real-world, pre-teen (and teen) problems and author Mary Winn Heider addresses them head on within the bounds of this funny, freakish fantasy. The story gets a little bit bogged down about two-thirds of the way through as all the various story-lines and subplots start to wrap up. It’s a poignant comedy so everything has to wrap up. But this is where we discover that maybe there was just a tad too much included (personally, I don’t think Grandma Vann really added anything to the story). Still, this is a riotous romp and a heck of a lot of fun. Looking for a good book? The Mortification of Fovea Munson by Mary Winn Heider is a delightful, whimsical, and very poignant tale for middle school readers.